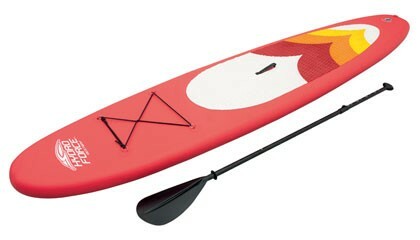 The SUP has three molded fins for directional stability. A steel tow ring and convenient deck handle to easily pick up and carry the SUP. The drop stitch material provides unparalleled strength and durability. All of our SUPs come with a standard warranty period, so that you have the peace of mind that in the unlikely event that you were to experience a problem we are here to help you. You can keep your SUP clean using any mild household cleaner such as diluted washing up liquid. Please ensure that the SUP is thoroughly clean and dry before storing away. Please ensure that the pressure gauge is used when inflating the SUP as to not over inflate the item. Do not drag the SUP when moving as abrasive surfaces can cause damage to the SUP.